It’s not a big deal. 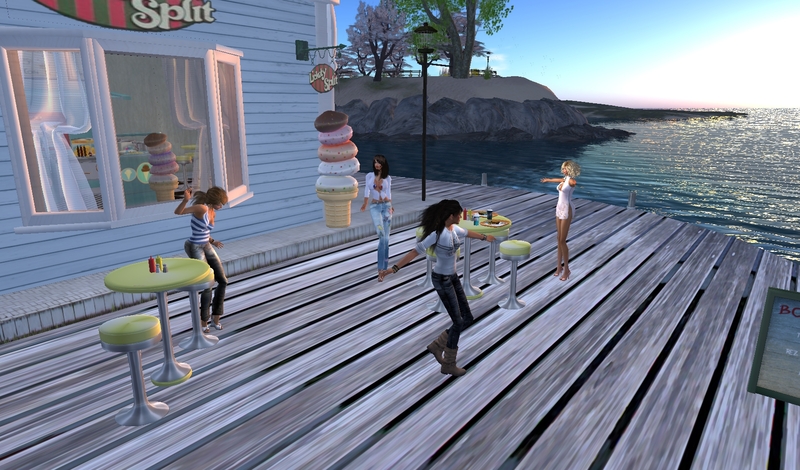 When Leanna got inworld I asked if she felt like hanging out over at The Chandlery on Marblehead. She said yeah and we went over there. I tended bar, sorta, and Leanna jumped up on one of the tables and started dancing. That’s me on the bar, kinda bartending, sorta. And of course, that’s LeLe dancin’ & prancin’ on the table. A little later I saw Sommer and asked if she’d join us and she did. Then we wandered over to Sommer’s ice cream parlor, Lickety Split. And then we ended up outside and the next thing we knew, Cindy Johnsky joined us. And we ate ice cream, hamburgers, fries and who knows what else. If you look at the rounded dock, Lickety Split is right there. And if you look real close you’ll see Sommer, Leanna and me. We listened to the region music stream, which happened to be pretty cool. So we just started dancing. You can’t plan this kind of thing and get the same result. You can have fun if you plan something like this, but spontaneity and serendipity are can’t be planned. Back left is Cindy and Sommer. We were just dancing and goofing off. Oh, the serenpitity of the thing is, as we wandered around some ideas began forming for parties and events. And Leanna started thinking this is a project she’d like to take on. This entry was posted in Journal and tagged Community, Second Life. Bookmark the permalink. It was a blast…..but i think I ate too much! Hiya there LeLe! I’m hoping you can carve out some time to organize an event or two or even a regular event there at either the Chandlery or Lickety Split. Sommer seemd very open to ideas. Been a while since seeing things like this in the metaverse. The metaverse I live in, Second Life, has come a very long way since I entered. I was thinking this morning, I remember when I first arrived in SL the shoes were soooo ooogly. Women had some pretty good choices but men’s choices were so pathetic, many guys went barefoot. some still do. Things have changed and there is so much more space to explore. We had so much fun! Who would have guessed Leanna was a wild table dancer! Who can resist ice cream on a hot summer night? Every once in awhile things just flow right and all of a sudden you are having fun. I suspect it has something to do with the peeps. Easygoing seems to be the magic exlixir. Me too Becky… same thing in real life. I think we can setup a framework that allows these things to happen, but you can’t really plan it. And it’s not like it was the coolest thing in the work, it just felt great. We have to keep working on a framework where these things happen all the time. Hi Vanessa… If I’d seen you I’d have forced you to come join us, because as we know, you do everything I ask. hahahhahahha.